I'm on a hunt for the best of the best sticky stuff that works for me. I'm fairly picky about my sticky stuff-- so much that I won't use the plain poster putty people prefer. Have I mentioned I like alliteration? 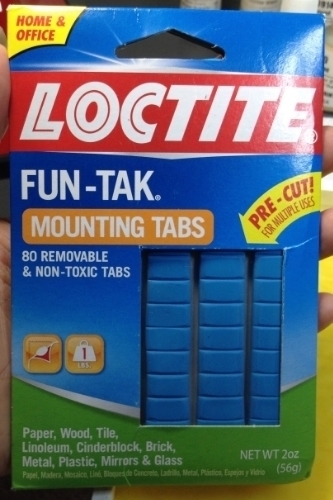 Anyway, I've been using the 1x1" Scotch Restickable Tabs for Mounting. Previously, I used the foam tape which would leave residue and sticky foam bits on the bottom of my miniature. I chose the restickable tabs since they're not permanent, but they're not strong enough to hold up to long sessions of painting under the lamps. I much prefer the sticky tape over the sticky putty, but I'm staying open-minded! 30 minutes down, 3.5 hours left! So far, the Loctite is holding fast to the wooden spool I'm using!